The Eccotemp 45HI-NG is the largest indoor model of the Eccotemp tankless line. Rated at impressive 6.8 GPM and 140,000 BTU per hour, the 45HI-NG can meet all the hot-water needs of a standard home or apartment with one or two bathrooms, as well as smaller commercial applications. The compact, wall mounted 45HI-NG is powered by natural gas and is also split system adaptable, which can further increase efficiency and hot water delivery speed. With its fully automated control system, the Eccotemp 45HI-NG is the ideal choice for any standard sized home. The Advantage ADV150FDCH Electric Tankless Water Heater provides a Whole Home hot water solution utilizing patented heating technology that offers instant hot water on demand. Our Electric Tankless units are ideal for Whole Home hot water with applications such as sinks, showers, tubs, washing machines and dishwashers. On-demand hot water heating means no pre-heating or stand-by heat loss, saves energy and reduces water-heating costs by up to 50%. Our ADV150FDCH is a 240V/15KW/60Hz Whole Home water heater that is easy to install as it simply wires [requires 6 gauge AWG (American Wire Gauge) copper wire] into a 240V breaker (min required one 60 Amp breaker) and uses National Pipe Thread NPT standard Copper = inch fittings. Our units are efficient and economical and offer multiple residential and commercial applications. The Eccotemp iE-11 11kW Electric Tankless Water Heater provides instant hot water for one application such as a single shower, sink, washer, or dishwasher located in warmer climates averaging incoming water temperatures above 650F (180C). The iE-11 is also a great solution for in-floor heating. The iE Series has a sleek and modern design that makes it one of the most attractive water heating units on the market. With a front panel made entirely of black glass, it features touchscreen controls and a display showing water temperature, water flow, and child lock controls. CECO180 DVLN water heaters provides all the hot water you'll ever need for 2 - 3 bathroom homes. Next Generation Burner Technology. 0.26 GPM Minimum Flow Rate, .40 GPM Minimum Activation Flow Rate. UMC-117 remote control and 10 ft. of thermostat wire is included. High-altitude capability up to 9,840 ft. elevation above sea level (no chip required). Guardian OFWTM overheat film wrap. Use RTG-20147 3 inch /5 inch Concentric Vent System with Integrated Condensate Collector. Rheem Platinum Gas Tankless water heaters provides all the hot you'll ever need for 2 - 3 bathroom homes, PVC or CPVC S636 approved venting for an economical vent option. Next Generation Burner Technology. 0.26 GPM Minimum Flow Rate, .40 GPM Minimum Activation Flow Rate. UMC-117 remote control and 10 ft. of thermostat wire is included. High-altitude capability up to 8,400 ft. elevation above sea level (no chip required). Guardian OFWTM overheat film wrap. Cold water sandwich is eliminated with exclusive idle mode. Built in Condensate neutralizer eliminates acidic condensate from going into drains. 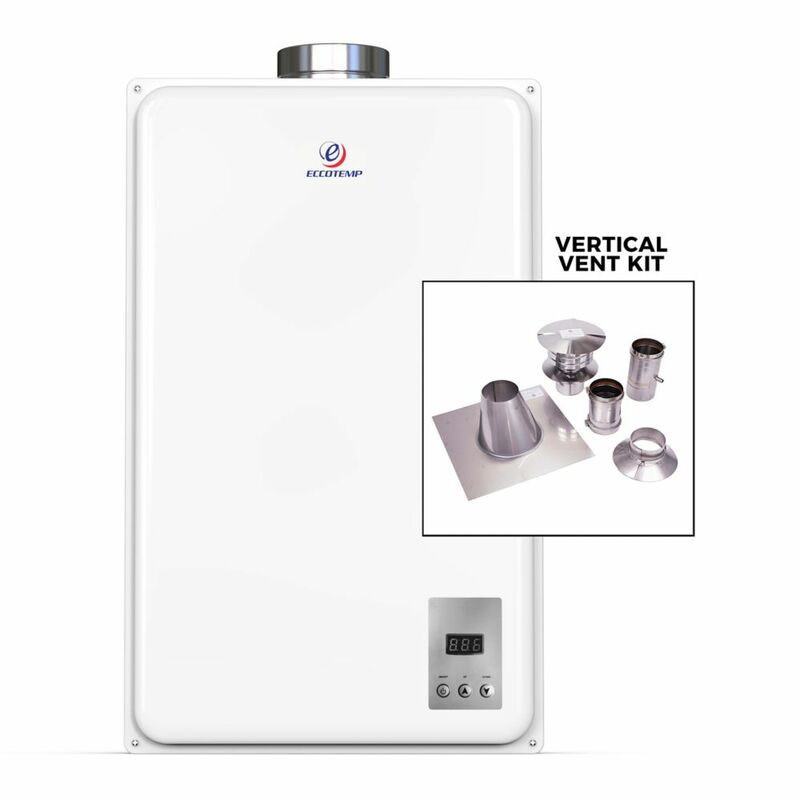 Eccotemp 45HI-NG Indoor Natural Gas Tankless Water Heater (w/ 4" Vertical Vent Kit) The Eccotemp 45HI-NG is the largest indoor model of the Eccotemp tankless line. Rated at impressive 6.8 GPM and 140,000 BTU per hour, the 45HI-NG can meet all the hot-water needs of a standard home or apartment with one or two bathrooms, as well as smaller commercial applications. The compact, wall mounted 45HI-NG is powered by natural gas and is also split system adaptable, which can further increase efficiency and hot water delivery speed. With its fully automated control system, the Eccotemp 45HI-NG is the ideal choice for any standard sized home. Eccotemp 45HI-NG Indoor Natural Gas Tankless Water Heater (w/ 4" Vertical Vent Kit) is rated 3.0 out of 5 by 2. Rated 3 out of 5 by Burr from Uneven temperatures. Nothing like having a nice warm shower turn cold. Uneven temperatures. Nothing like having a nice warm shower turn cold. Rated 3 out of 5 by davey from TAKES TOOOOO LONG TO HEAT UP There may be endless amounts of hot water however to get hot water to your tap takes too long. You need 3-4 minutes to heat the water up to wash your hands. OVERATED!! !